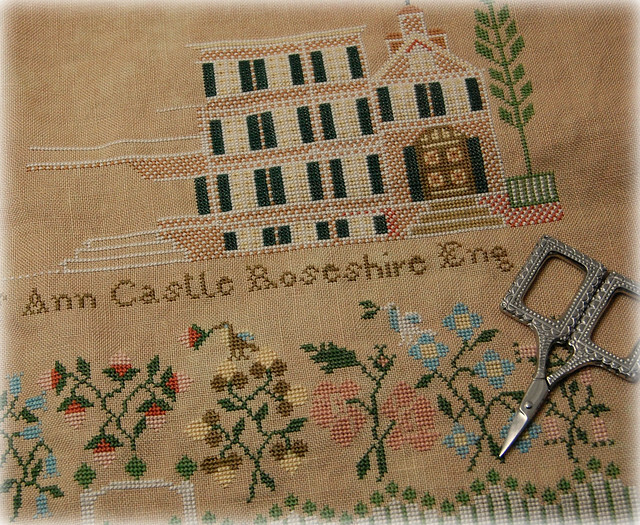 I'm still working on the castle part of Elizabeth Mears (it's going to take awhile - it's huge and solid stitching). 40 ct. Vintage Meadow Rue, NPI Silks. I also got a small start on the "Soar Sampler." It's so hard to photograph black linen though. I'm going to try again tomorrow when the lighting is better. I so need to order the silks and fabric for this. It's to die for! Gorgeous, and so worth all the effort of that solid stitching! I agree with Margaret--I need to get going on this also. I love seeing your progress--definitely easier than stitching it myself! So, so pretty and delicate. It looks wonderful Nicole... I'm in love with the picket fence. You are very right that that house takes a long time, but isn't it fun to "build" the large house? I'm looking forward to seeing more of your progress on this wonderful sampler. Wowza!!! This is going to be amazing!!!! You are an inspiration to be sure!!! The house will be done before you know it. I was truly possessed to finish mine quickly, but then I don't have little ones running around the house anymore. I received the Soar Sampler in the mail on Saturday. I am going to work it on black too(or navy). This looks so beautiful. GREAT job so far!! That building is going to be perfect. Oh my gosh, she's just gorgeous!! You do such great work and I really love the colors on this so much! Looks gorgeous Nicole, nice progress! I am looking forward to seeing your Soar sampler start. You are making good progress. Yes, solid stitching takes a while, but its going to look so good! Beautiful Nicole...just beautiful. Would appear that your construction project is progressing nicely!! Thanks for sharing. That castle is massive but really beautiful. Oh wow, she's gorgeous! I can't wait to see more. your blog is wonderful !!!! thanks you very much ! Wonderful progress, Nicole! I have to get some black fabric for Soar.... looking forward to seeing your progress. You are really coming along on the castle, Nicole! It's so pretty. I love the little fence. It's looking so great Nicole. You make me want to pull out mine and start working on it. I know that castle is huge, but you're really making good progress on it. The colours in this are gorgeous. Keep going on the castle it will be worth it when it is finished. I LOVE it, Nicole!! Your progress is fantastic. 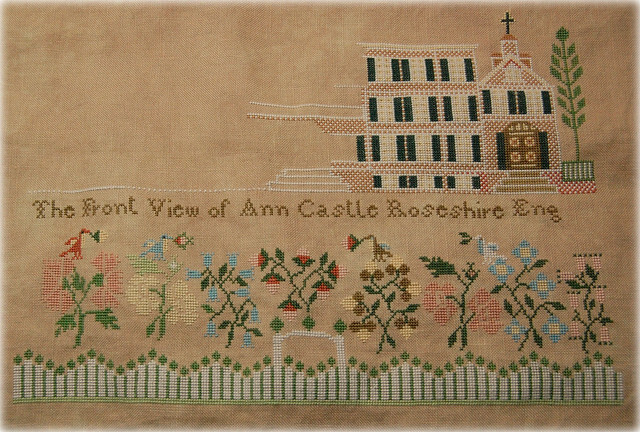 I want to stitch it but know the castle/house/building will drive me slowly insane. Did you read the history about it in Ellen's latest newsletter? I loved reading it. What a lovely piece! Look forward to seeing your progress. Elizabeth looks wonderful. I admire you for planning on using black linen. It will be gorgeous. It's coming along nicely, Nicole! Great progress so far; I love the colors! This is looking so beautiful. You are making great progress, especially on the house. I love the colours in this design.